If you reached our website thru a search engine, you might be pulling up an old list. Return to the home page and refresh to get the latest update! You Are Not Forgotten: The Vietnam POW / MIA medal. Debate and frustration over the fate of the those listed as Missing In Action from the conflict in South East Asia rages to this day. Over thirty years since the Marines were lost on Koh Tang in the "Mayaguez Incident", POW/MIA flags fly over everything from courthouses to Bike Week Rallies. One facet of the story of those still listed as Missing In Action that is little known is the creation of a medal by Congress to be awarded specifically to the next of kin of the missing loved ones. The Vietnam MIA Medal stemmed from a resolution by Senator Robert Byrd (W.VA) and was established by Act of Congress (Section 1267 of PL 98-94) on September 24, 1983. 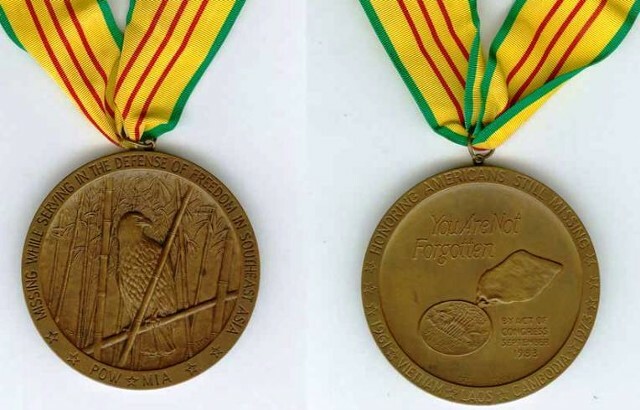 The medal was created to be presented by Congress to the next of kin of those American military personnel still listed as Missing In Action in Southeast Asia. Designed by Vietnam veteran Thomas Mason Nielson, it is a three inch bronze medallion suspended from a neck ribbon (crevatte) in the colors of the Vietnam Service Medal. The obverse of the medal reads MISSING WHILE SERVING IN THE DEFENSE OF FREEDOM IN SOUTHEAST ASIA with the lettering POW MIA. The design is that of an eagle in a bamboo grove to symbolize an American in captivity in the jungle. The reverse of the medal reads YOU ARE NOT FORGOTTEN and BY ACT OF CONGRESS SEPTEMBER 1983 surrounding a Vietnam Service Medal that awaits it's chance to be picked up by the missing serviceman. The outter rim reads HONORING AMERICANS STILL MISSING 1961 * VIETNAM, LAOS, CAMBODIA * 1973. The medal was presented in a fitted and hinged brown case with the Great Seal of the United States embossed on the interior of the lid. I know of no document or certificate that was presented with the medal. The first medal was presented on July 21st, 1984 to retired Army Colonel Earl P. Hopper whose son, an F-4 pilot, had been listed as missing since Jan. 10, 1968. Presentation ceremonies were then held across the U.S. A 1985 article written for VFW Magazine tells that "Those coming forward ranged from mothers now in their 70's to the 22 month old grandniece of an MIA." It is unknown how many medals were struck or eventually awarded however there were 2,485 personnel listed as MIA at the time the medal was created.. It is important to note that this was to be a one time award with no subsequent awards to be struck or given. The California Congressional Commemorative Medal Ceremony held on September 17, 1984 is probably typical of the ceremonies held across the nation. The event took place at McClellan Air Force Base and included the Navy Band, a 21 gun salute, and a Missing Man flyover. The families of 123 men were present. The missing were members not only of the Army, Air Force, Marines, and Navy but four civilians. * Another California presentation ceremony took place on November 1st 1984 at Miramar Naval Air Station at San Diego. With a similar program and presided over by Rear Admiral Thomas J. Cassidy, Jr. this event saw the presentation of medals to another 29 families. Interestingly some names overlap both ceremonies. It is unknown if duplicate medals were presented. As I write this article, the best accounting I can find is that some 1,800 men are still listed as Missing in South East Asia. JCRC remains active in attempting to recover the remains of those lost though few still retain hopes of finding anyone alive. Collector and historian knowledge of this scarce Federal Commemorative medal is another way to honor the memory of these men.